For more than 100 years, Woodlawn Hospital has provided quality healthcare to the residents of Fulton County and surrounding areas. Woodlawn Hospital has grown from a small house on Pontiac Street to a 25-bed critical access hospital on 33 wooded acres, which can be viewed from every patient room. 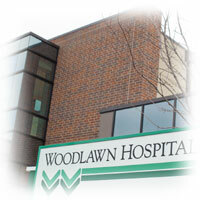 From our beginnings in 1905, Woodlawn Hospital has been a leader in rural healthcare. With state-of-the-art technology and compassionate, patient-centered care, Woodlawn Hospital offers a wide range of services including a birthing center, cancer center, emergency medical services, laboratory services, critical care and medical/surgical units, radiology, rehabilitation services, respiratory care services, sleep center, inpatient and outpatient surgical services, and more. Read more about our departments and services. Medical clinics in Rochester, Akron, Argos and Fulton compliment Woodlawn Hospital by specializing in cardiology, critical care, family medicine, general surgery, gynecology, internal medicine, neurology, obstetrics, oncology, orthopedics, pain management, pediatrics and adolescent medicine, pulmonology, and urology. Our professional services, knowledgeable staff, and commitment to maintain the highest standard of care, allows us to confidently handle the present and future needs of patients in our community.